What makes a good black and white photograph? There are of course many answers to this question, so for this post I want to concentrate on one particular aspect and that is the use of a light subject set against a dark background. Put another way it is the natural contrast between two key elements of a composition. Finding suitable subjects in the landscape is not necessarily that easy and may require side lighting or even back lighting to give the desired effect. I have chosen four images for this post all taken on my recent trip to Snowdonia. Blessed on a number of days with lovely sunshine, the chances of capturing a ‘light on dark’ image were improved as the bright light increased the amount of contrast. Exposing in such conditions can be a challenge, as it’s vital not to blow the highlights but I still wanted some shadow detail which I could bring out later in post processing. There are though occasions when I don’t want any shadow detail and the blacks can be deep, dark and even mysterious as they provide no information to the viewer whatsoever. 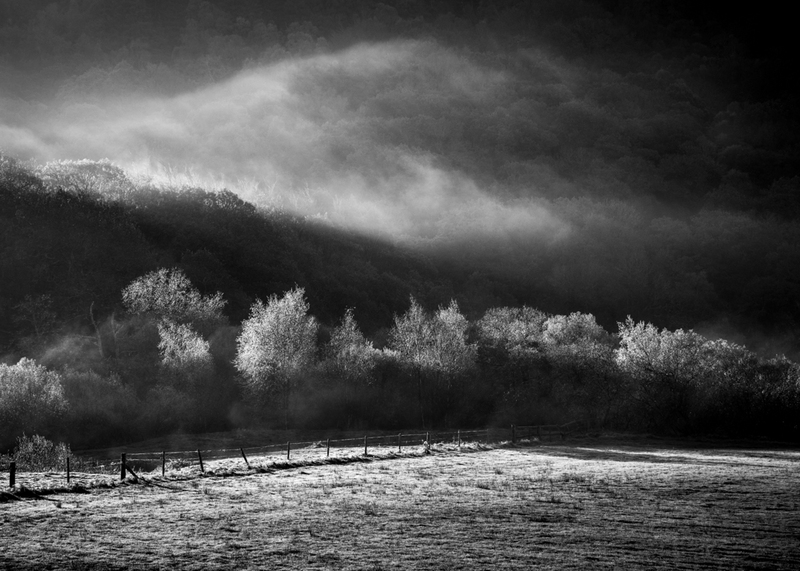 This technique may not always be appropriate for a landscape image but even so, the contrast between light and dark can be enhanced when required from a purely artistic point of view. The first image at the top of this post was taken as the last of the early morning mist was being burnt off by the strengthening sunshine which was still low in the sky. The light is coming from about 10 o’clock (from where I am standing and pointing the camera), but had the sun been behind me this shot would not have worked. It totally relies upon the light coming from a certain direction to illuminate the autumn leaves on the tress, so they stand proud of their darker background. Do click on the image to view a larger version as you will see there is still detail in the back drop of trees which are shrouded in mist. In the second image the light is coming from the left. Like the first shot it was taken fairly early in the morning. 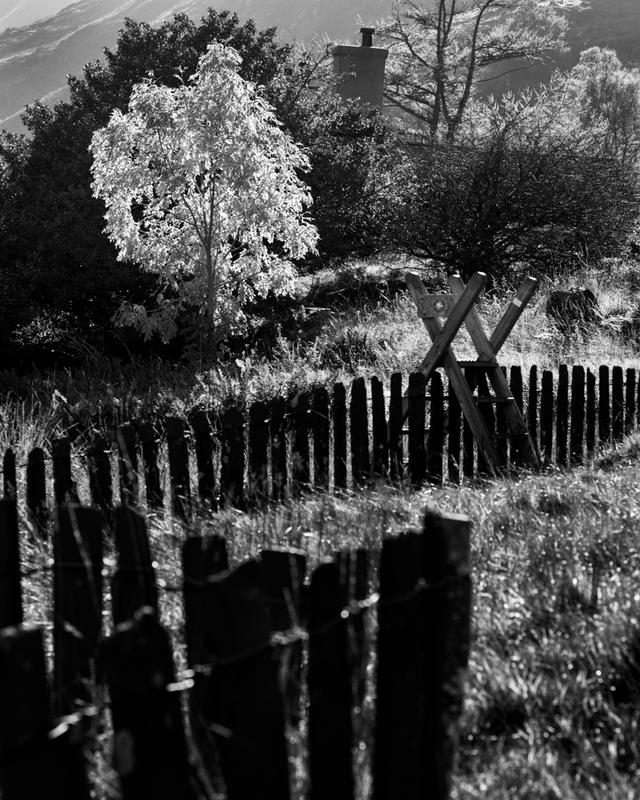 The sun lights up the fence and the trees, which like the first image stand out against the dark background. The water in the foreground is reflective adding another dimension to the picture. The third image, above, is I think a very good example of ‘light on dark’ and why this type of shot makes a good monochrome photograph. Here I have focused on the tree in the top left of the frame. The yellow leaves catching the bright sunlight, creating virtually a silhouette of light against the darker tree behind it. The wire and slate fence leads your eye into the picture but being out of focus and dark does not detract from the brightness of the tree. This time the light was coming from about 2 o’clock. Personally I like the chimney, it just adds another point of interest but is still secondary to the main event. Lastly I had to include a picture a sheep. How could I visit Wales and not have a sheep shot? Not literally of course, just photographically speaking! It’s not the greatest image taken on my trip but it does once again illustrate that the natural contrast between the subject and the background works in black and white. In colour this picture really wouldn’t be very pleasing to look at. 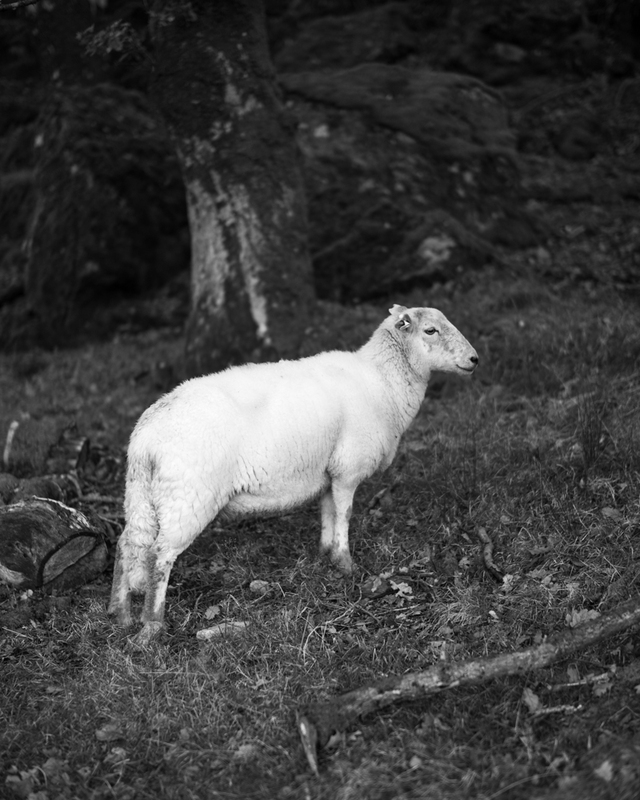 What is critical to this shot is the detail which has been retained in the highlights in the sheep’s coat. A minimal depth of field has also been used to blur the background. As mentioned earlier, all of these images are worth viewing ‘large’, so do click on each one to see the photograph in a new window. 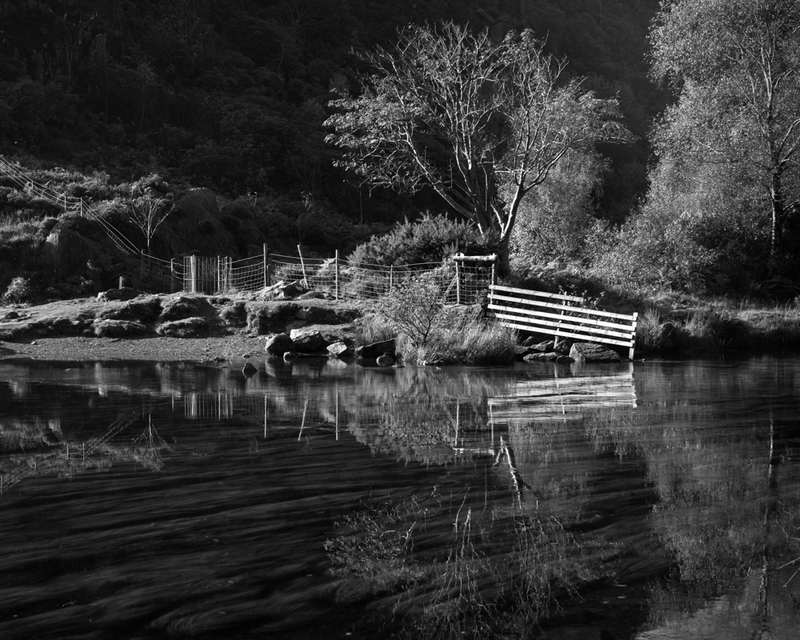 Early morning in Snowdonia – with or without a tripod? Thanks very much James. First time visit for me but already wanting to return. Burning Mist is so beautiful ! Lovely details . That’s very kind of you Dina. Much appreciated.